Trivia Mafia, the leaders in brainy bar antics in Minnesota have brought their awesome brand of trivia to places as far-flung as Duluth, Milwaukee, and Excelsior! 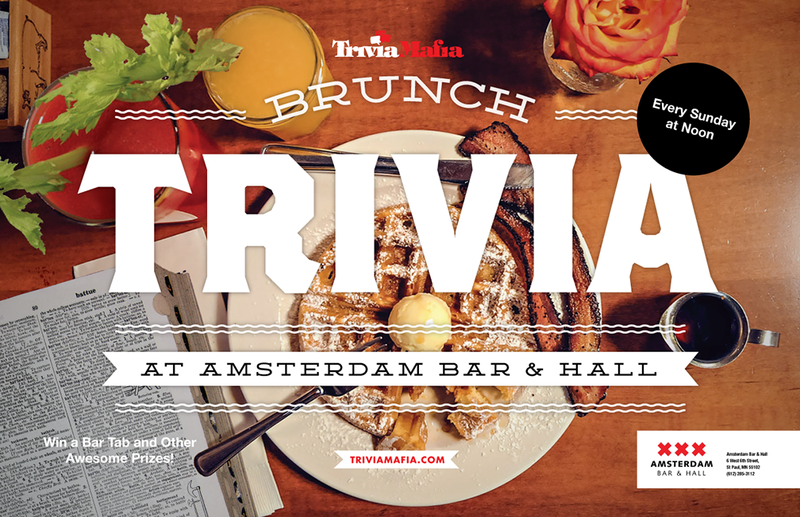 What’s better paired with trivia than brunch! If you are coming to eat, we encourage you to arrive before noon to avoid a long wait. If you order food after noon, you may need to expect a longer wait for your meal due to a high volume! There’s no cost to play. It’s totally free! The Amsterdam Bar and Hall is Saint Paul’s premier and most versatile music venue, bar/restaurant and event space and sister bar to the 331club in Northeast. Like the 331 was at the forefront of the arts boom in NE Minneapolis, we are bringing that energy to downtown St. Paul. In partnership with Hamilton Ink Spot and Eclipse Records, we focus on making our stretch of Wabasha hopping with entertainment. Copyright © 2019 Amsterdam Bar and Hall.